Who needs affordable junk removal and hauling services in the city of St. Pete, Florida? Is it you? Is it your neighbor? Maybe both! It’s probably safe to say that just about anyone, at any given time, can find him or herself buried (figuratively speaking) in junk accumulation. Sadly, sometimes it becomes more than figuratively when an individual fails to recognize that what once was a treasure has now become a piece of worthless junk. Don’t be that person! Don’t keep piling those old Geographic magazines up in the corner….put them into the junk removal stack. Be realistic...how many cardboard boxes are you going to need in the future? If you haven’t used them by now, you never will. Fold them up or break them down and toss them into our dumpster so our pros can haul them away to the proper place of disposal. Has your collection of sea shells gotten out of control? Let our junk removal crews haul them away. They might even find someone out there that would love to have the shells. Our company reps will donate items that may still have value to others. Our dumpster and trailer rentals accommodate the needs of all St. Pete residents and business owners alike. Don’t put off until tomorrow what should be done today! Let us help you declutter your personal and business space. An over crowded area causes chaos and creates a stage for disaster. Falls often become the outcome of disorder and health issues arise when everything is so crammed together that access to cleaning is hindered. Environmental laws restrict tossing out electronics, such as televisions and computers. That presents a quandary for folks who are stuck with a broken TV. What can they do with it? Turn it over to the junk removal crews at Junk It Hauling. As a “green” business, we recycle whatever we can and as good samaritans, our hauling company will donate reusable items to charitable organizations. Among the list of appliance and electronic removal are refrigerators, freezers, microwaves, dishwashers, washing machines, dryers, televisions and computer devices. If you or anyone you know needs a helping hand to get rid of anything, Junk It Hauling is the junk removal company to call. Junk It Hauling offers demo work and clean up services for heavy duty salvage from fires, floods and storm damage. Our rental trailers are built to handle large loads of substantial weight, such as construction material. Our driver/haulers deliver the rental dumpster. Our pros haul it away. Junk It Hauling offers junk removal, hauling and demo work for residential and commercial properties in St. Pete, Fl. Homeowners, property managers, contractors and roofers are just a few of the type of customers that we work with and for. Our trailer rentals and hauling services are available for both large and small junk removal projects. Our demo work in St Pete is accurate and professional. Just to name a few items of bulk that get ripped out in a demo job, we haul cabinets, counter tops, wallboard, tile, and wood. Junk It Hauling also partners with construction workers and roofers by supplying dumpster and trailer rentals, which offer a great deal of convenience. The use of a container in which all debris can be collected at once is more economical and adds an element of speed to a hauling job. We offer the removal of furniture of all kinds (inside and outside) and hauling services to homeowners in St. Pete, as well as office managers. Tired of looking at that six year old carpeting? We’ve got you covered (or, more accurately, uncovered!) Our junk removal crews will rip out rugs and padding and haul it all away for disposal. One avenue of junk removal that many other hauling companies reject is handling hoarder situations in St. Pete, Fl. Junk It Hauling has a well trained team that stands up to the challenges of hoarder cleanouts. As you can imagine, cleaning a hoarding backup of clutter and trash goes way beyond the description of junk removal...it could be considered hazardous to one’s health and welfare. Our trailer rentals have held and hauled away tons of junk, rubbish and worn out furniture from St. Pete residential and commercial communities throughout the ten plus years we have been in the junk removal business. Allow us to acquaint you with our cleanup, junk removal and hauling services for foreclosed properties and abandoned apartments. We work with realtors and bank managers to clean out places that have been neglected or even vandalized. Our junk removal teams for St. Pete clean up what can be restored back to decent condition and remove and haul away all items that qualify as junk. Property owners don’t always have the spare time or the receptacles to do the messy work themselves but it’s vital that their properties are prepared for new occupants to move in. The services of Junk It Hauling ensure that the process is done as quickly and thoroughly as possible. And our trailer rentals are the means to complete the project. ​Is your yard knee deep in tree limbs and twigs in the aftermath of a St. Pete storm? 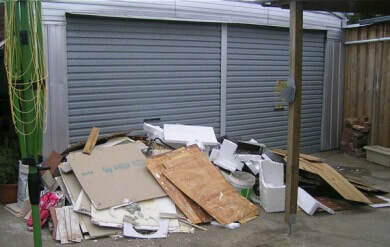 Junk removal services from Junk It Hauling include hauling of all outside debris. Our junk removal crews can clear your front and back properties of all miscellaneous litter and haul the junk to the local landfill in one of our trailer rentals. You can’t count on some junk removal and hauling companies to remove specialty junk but you can always rely on the junk removal and hauling experts from Junk It Hauling to handle even the most unusual of items. For example, our pros will remove and haul away a fish tank, a full wall size mirror, a jacuzzi or a rock garden. You name it, our guys can handle it! The junk removal game is not for the weak. Our haulers have to be prepared to lift junk of all weights and sizes. They have to be mathematicians at times when trying to configure a way to remove an appliance or other large piece of furniture from a cramped space. If the item needs to be saved, the pros have to do this in a way that damage can be avoided. Then there is the procedure of loading the trailer rental In order to save space and keep junk items organized, the dumpster must be loaded in the correct order. Our junk removal pros have to be able to anticipate what size trailer or dumpster rental is needed for a client and also how many containers they might actually require for a job. Junk It Hauling offers several different sizes of dumpster and trailer rentals. Demo work isn’t cut and dried either. It takes a certain amount of skill and strength to do the job without destroying that which needs to be untouched! ​Junk It Hauling offers affordable quality junk removal and hauling services along with trailer and dumpster rentals.